The world is our oyster for foods and treats! There is also a plethora of information regarding toxic foods for us humans, so we are less likely to ingest odd things. It isn’t the same way for dogs and cats as for us humans, we have to be a bit more careful with them. So many different toxins exist for our pets, which are not an issue for us. Everyone knows about chocolate, grapes and raisins, but some of the lesser known toxins such as macadamia nuts and walnuts, caffeine, fatty foods being predisposed to cause pancreatitis, xylitol (in gums, candies, etc.,), onions or garlic. This is just to name a few! Do pets even need treats? Nutritionally, treats aren’t really necessary for us to give our pets. Many dogs love their kibble and will be just as happy with a piece of kibble as any other treat, and it is safer for their GI tract (less vomiting or diarrhea!). Does your pet have allergies or food reactions (sensitive GI tract)? We have dogs in the clinic almost daily with vomiting or diarrhea issues with having a new treat. If you have a pet with allergies, or has had issues such as these in the past- don’t get creative with new treats since they are at high risk of an issue. Calorie content of treats should be less than 10% of the total amount of calories needed in a day. Just like us, we can’t eat only treats or our nutrition will not be properly balanced. If you would like to know the amount of calories your pet should ingest in a day, give us a call and we can calculate that for you! Everything in moderation. So what types of treats should we offer our dogs? We need to balance ‘tasty’ and ‘healthy’ for our pets. Small amounts of vegetables such as carrots, cucumbers or apples can be great treats for our pets. Since raw and freeze dried foods and treats carry the risk of bacteria which can make pets ill (and us! 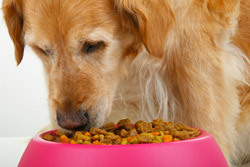 ), we recommend using cooked food and treats (See: http://www.wormsandgermsblog.com/files/2008/04/M2-Raw-Meat-Owner1.pdf for more information). With puppies, we can use bland items such as small amounts of plain cheerio cereal as training treats. If they love their kibble, use that as training treats instead- just reduce the amount they would eat at their meals!